This enclosure provides policy and procedure for acquisition programsA directed, funded effort that provides a new, improved, or continuing materiel, weapon, information system, or service capability in response to an approved need. Acquisition programs are divided into categories that are established to facilitate decentralized decision making, execution, and compliance with statutory requirements. that provide capabilities to fulfill urgent operational needs and other quick reaction capabilities that can be fielded in less than 2 years and are below the cost thresholds of Acquisition Category (ACAT) I and IA programs. a. DoD’s highest priority is to provide warfighters involved in conflict or preparing for imminent contingency operations with the capabilities urgently needed to overcome unforeseen threats, achieve mission success, and reduce risk of casualties, as described in DoD Directive 5000.71 (Reference (cc)). The objective is to deliver capability quickly, within days or months. DoD Components will use all available authorities to expeditiously fund, develop, assess, produce, deploy, and sustain these capabilities for the duration of the urgent need, as determined by the requesting DoD Component. Approval authorities for each acquisition program covered by this enclosure will be delegated to a level that promotes rapid action. (a) Joint Urgent Operational Needs (JUONs) and Joint Emergent Operational Needs (JEONs). These are either an urgent need identified by a Combatant Commander, the Chairman of the Joint Chiefs of Staff (CJCS), or the Vice Chairman of the Joint Chiefs of Staff (VCJCS) involved in an ongoing contingency operation (i.e. a JUON) or an emergent need identified by a Combatant Commander, CJCS, or VCJCS for an anticipated or pending contingency operation (i.e. a JEON). For JUONs and JEONs, the validation approval will be by the Joint Staff in accordance with the Joint Capabilities Integration Development System (JCIDS) Supports the Chairman of the Joint Chiefs of Staff (CJCS) and the Joint Requirements Oversight Council (JROC) in identifying, assessing, and prioritizing joint military capability requirements. detailed in the Chairman of the Joint Chiefs of Staff Instruction (CJCSI) 3170.01I (Reference (e)). Program execution for JUONs and JEONs will be assigned in accordance with DoD Directive 5000.71. The MDA for JUONs and JEONs will be determined at the DoD Component level except in very rare cases when the MDA will be designated in an ADM by the Defense Acquisition Executive (DAE). (b) DoD Component-specific UON Capability requirements identified by a DOD Component as impacting an ongoing or anticipated contingency operation. If left unfulfilled, UONs result in capability gaps potentially resulting in loss of life or critical mission failure. DoD Component UONs are applicable to only one DoD Component. DoD Components, in their own terminology, may use a different name for a UON. UONs affecting two or more DoD Components are Joint UONs. . These are defined in CJCSI 3170.01I and further discussed in DoD Directive 5000.71. Approval authorities for DoD Component UONs, including their validation, program execution, and the designation of the MDA, will be at the DoD Component level. (2) A Warfighter Senior Integration Group (SIG)-Identified Urgent Issue. This is a critical warfighter issue, e.g. materiel support to a coalition partner, identified by the Co-Chairs of the Warfighter SIG in accordance with DoD Directive 5000.71. The Co-Chairs of the Warfighter SIG will approve a critical warfighter issue statement and provide instructions to DoD Component(s) on program execution and management. (3) A Secretary of Defense or Deputy Secretary of Defense Rapid Acquisition Authority (RAA) Determination. This is a Secretary of Defense or Deputy Secretary of Defense signed determination that is made in response to a documented deficiency following consultation with the Joint Staff. RAA should be considered when, within certain limitations, a waiver of a law, policy, directive, or regulation will greatly accelerate the delivery of effective capability to the warfighter in accordance with section 806(c) of P.L. 107-314 (Reference (cd)). a. MDAs and program managers Designated individual with responsibility for and authority to accomplish program objectives for development, production, and sustainment to meet the user’s operational needs. The PM shall be accountable for credible cost, schedule, and performance reporting to the Milestone Decision Authority (MDA). will tailor and streamline program strategies and oversight. This includes program information, acquisition activity, and the timing and scope of decision reviews and decision levels. Tailoring and streamlining should be based on program complexity and the required timelines to meet urgent need capability requirements consistent with applicable laws and regulations. b. DoD Components will employ, to the extent possible, parallel rather than sequential processes to identify and refine capability requirements, identify resources, and execute acquisitions to expedite delivery of solutions. Formal milestone events may not be required. Acquisition decision making and associated activity will be tailored to expedite acquisition of the capability. Development will generally be limited, and the MDA can authorize production at the same time development is approved. c. DoD Components will ensure that financial, contracting, and other support organizations (e.g., Defense Contract Audit Agency, Defense Contract Management Agency, General Counsel) and prime and subcontractors involved with aspects of the acquisition program are fully aware of the urgency of the need and will ensure expedited action. d. Generally, funds will have to be reprioritized and/or reprogrammed to expedite the acquisition process. If a capability can be fielded within an acceptable timeline through the normal Planning, Programming, Budgeting, and Execution System, it would not be considered appropriate for urgent capability acquisition. e. Consistent with the emphasis on urgency, if the desired capability cannot be delivered within 2 years, the MDA will assess the suitability of partial or interim capabilities that can be fielded more rapidly. In those cases, the actions necessary to develop the desired solution may be initiated concurrent with the fielding of the interim solution. Critical warfighter issues identified by the Warfighter SIG, per DoD Directive 5000.71 (Reference (cc)), will be addressed as determined by the Co-Chairs of the Warfighter SIG. The following paragraphs describe the main activities associated with Urgent Capabilities Acquisitions: Pre-Development, Development, Production and Deployment (P&D), and Operations and Support (O&S). The activities detailed in this enclosure are not separate from or in addition to activities performed as part of the acquisition system but are a highly tailored version of those activities and are intended to expedite the fielding of capability by tailoring the documentation and reviews normally required as part of the deliberate acquisition process. Figure 10 depicts a representative acquisition. (1) Purpose. The purpose of Pre-Development is to assess and select a course or courses of action to field a quick reaction capability and to develop an acquisition approach. (2) Initiation. Pre-Development begins upon receipt of either a validated UONAdd a Tooltip Text, approval of a critical warfighter issue statement by the co-chairs of the Warfighter SIG per DoD Directive 5000.71, or a Secretary of Defense or Deputy Secretary of Defense RAA determination document, where the associated documentation serves as the justification to continue the action until such time as the disposition action discussed in paragraph 4e(5) of this enclosure. (a) Upon Pre-Development initiation, the designated Component Acquisition Executive (CAE) Secretaries of the military departments or heads of agencies with the power of redelegation. In the military departments, the officials delegated as CAEs (also called service acquisition executives (SAEs)) are respectively, the Assistant Secretary of the Army for Acquisition, Logistics, and Technology (ASA(AL&T)); the Assistant Secretary of the Navy for Research, Development, and Acquisition (ASN(RD&A)); and the Assistant Secretary of the Air Force for Acquisition (ASAF(A)). The CAEs are responsible for all acquisition functions within their components. This includes both the SAEs for the military departments and acquisition executives in other DoD components, such as the U.S. Special Operations Command (SOCOM) and Defense Logistics Agency (DLA), which also have acquisition management responsibilities. will immediately appoint a Program Manager Designated individual with responsibility for and authority to accomplish program objectives for development, production, and sustainment to meet the user’s operational needs. The PM shall be accountable for credible cost, schedule, and performance reporting to the Milestone Decision Authority (MDA). and an MDA. If the DAE has retained MDA authority, he or she will either appoint a Program Manager or task a CAE to do so. 1. Assesses the required capability and any recommended non-materiel options and, if not adequately stated, determines the performance thresholds for the minimal set of performance parameters required to mitigate the capability gap. a. The range of feasible capabilities, near, mid, and/or long term, to include consideration of an existing domestic or foreign-made system. b. The acquisition risk (cost, schedule, and performance) and the operational risk of each solution. c. The operational risk to the requesting Commander if an effective solution is not deployed in the time specified by the Commander. 3. Presents a recommended course of action for review and approval by the MDA. 4. If the Program Manager is unable to identify an effective solution, the Program Manager will notify the MDA. The MDA will in turn notify the DoD Component validation authority. If it is a JUON or JEON, a critical warfighter issue identified by the Warfighter SIG, or a Secretary of Defense RAA Determination, the MDA will notify the DAE and the requirements validation authority through the Director, Joint Rapid Acquisition Cell (JRAC), and the Deputy Director of Requirements, Joint Staff. (c) The Program Manager will present the recommended course(s) of action to the MDA and the requirements validation authority. The selected course of action will be documented in an ADM. More than one course of action may be selected to provide the phased or incremental fielding of capabilities. (d) For each approved course of action, the Program Manager will develop a draft Acquisition Strategy and an abbreviated program baseline based on readily available information. In the context of this enclosure, the documentation requirement is for the minimal amount necessary to define and execute the program and obtain MDA approval. This documentation may take any appropriate, written form; will typically be coordinated only with directly affected stakeholders; and will evolve in parallel with urgent capability acquisition activities as additional information becomes available as a result of those activities. (e) The Acquisition Strategy will comply with the requirements in Table 11 of this enclosure and the items in Table 2 of Enclosure 1 that are required for ACAT II and III programs (unless modified by Table 11); however, a streamlined, highly tailored strategy consistent with the urgency of the need will be employed. Regulatory requirements will be tailored or waived. The tailored Acquisition Strategy should be relatively brief and contain only essential information, such as resourcing needs and sources, key deliverables, performance parameters, key risks and mitigation approaches, a production schedule, a contracting methodology and key terms, preliminary plans for assessment (which may or may not include test and evaluation (T&E)), deployment, training, and sustainment. Information technology (IT), including National Security SystemAny information system (including any telecommunications system) used or operated by an agency or a contractor of an agency, or other organization on behalf of an agency, the function, operation, or use of which: (1) involves intelligence activities; (2) involves cryptologic activities related to national security; (3) involves the command and control of military forces; (4) involves equipment that is an integral part of a weapons or weapons system; or (5) is critical to the direct fulfillment of military or intelligence missions. , provided in response to an urgent need require an Authority to Operate in accordance with DoD Instruction 8510.01 (Reference (bg)). A disposition decision should be made as early as feasible and decided upon at appropriate milestones or other decision points. (f) Funding for the acquisition program may be in increments over the program’s life cycle. The program life cycle begins upon Pre-Development initiation and ends upon completing the final disposition of the capability as described in the O&S portion of this enclosure. (g) When designing the Acquisition Strategy, the Program Manager, in collaboration with the requesting operational commander or sponsoring user representative will determine whether an operational prototype is necessary and include this determination in the Acquisition Strategy. (h) If the program has been placed under DOT&E oversight, a plan for operational testing must be approved by the DOT&E. DOT&E will report the results of required testing to the Secretary of Defense and provide copies to Congress and the MDA. Entry into Development is approved by the MDA. (1) The Program Manager will provide the Acquisition Strategy and Program Baseline to include the program requirements, schedule, activities, program funding, and the assessment approach and intermediate decision points and criteria as the basis for this decision. (a) Determine the feasibility of fielding the capability within the required timelines to include consideration of the technical maturity of the preferred solution(s). 1. Can be fielded within 2 years. 2. Does not require substantial development effort. 3. Is based on technologies that are proven and available. 4. Can be acquired under a fixed price contract. (c) Provide any exceptions necessary pursuant to section 804 (b)(3) of P.L. 111-383 (Reference (m)), including exceptions to the requirements of paragraphs 4b(2)(b)1 through 4b(2)(b)4. (d) Approve initial quantities to be produced and assessed (to include required assessment and training articles). (e) Approve the tailored Acquisition Strategy and Acquisition Program Baseline. These documents will be based on available information to be updated over time as directed by the MDA. (f) Decide if RAA, in accordance with section 806(c) of P.L. 107-314 (Reference (cd)), should be requested from the Secretary of Defense or Deputy Secretary of Defense to expedite the fielding of the capability. (g) Approve the planned testing approach. A normal Test and Evaluation Master Plan (TEMP) is generally not necessary. TEMPs are usually not appropriate for urgent capability acquisitions when there is minimal development work and minimal T&E to execute. Some test planning is usually required, however. In collaboration with the supporting operational test organization, a highly tailored and abbreviated test plan may be required by the MDA. The abbreviated test plan will describe a performance assessment approach that will include schedule, test types and environment, and assets required. An Operational Test Plan for the required pre-deployment performance assessment is generally adequate. If the defense urgent capability acquisition program is under DOT&E oversight, a TEMP is also not normally required; however, the Program Manager should prepare a combined operational and live fire test plan for DOT&E approval. (h) Approve any appropriate waivers to statute or regulation. Specify any additional authority the Program Manager may use to modify the acquisition approach without the specific approval of the MDA. (i) Authorize release of the RFP and related documents for development and any other MDA approved actions. (j) Document these decisions in an ADM.
(1) Development includes an assessment of the performance, safety, suitability, and survivability of the capability, but does not require that all identified deficiencies including those related to safety be resolved prior to production or deployment. The MDA will, in consultation with the user and the requirements validation authority, determine which deficiencies must be resolved and what risks can be accepted. (2) IT, including NSSAny information system (including any telecommunications system) used or operated by an agency or a contractor of an agency, or other organization on behalf of an agency, the function, operation, or use of which: (1) involves intelligence activities; (2) involves cryptologic activities related to national security; (3) involves the command and control of military forces; (4) involves equipment that is an integral part of a weapons or weapons system; or (5) is critical to the direct fulfillment of military or intelligence missions. , fielded under this enclosure require an Authority to Operate in accordance with DoD Instruction 8510.01 (Reference (bg)). DoD Component Chief Information Officers will establish processes consistent with DoD Instruction 8510.01 for designated approval authorities to expeditiously make the certification determinations and to issue Interim Authorization to Test or Authority to Operate. (1) Entry into P&D is approved by the MDA. (a) The Program Manager will summarize the results of Development activity and the program assessment to date. The Program Manager will present plans to transport, deploy, and sustain the capability; to conduct Post-Deployment Assessments; and to train maintenance and operating personnel. This information will be provided to the MDA for approval. 1. Whether the capability has been adequately reviewed, performs satisfactorily, is supportable, and is ready for production and deployment. 2. When assessments of fielded capabilities are required. 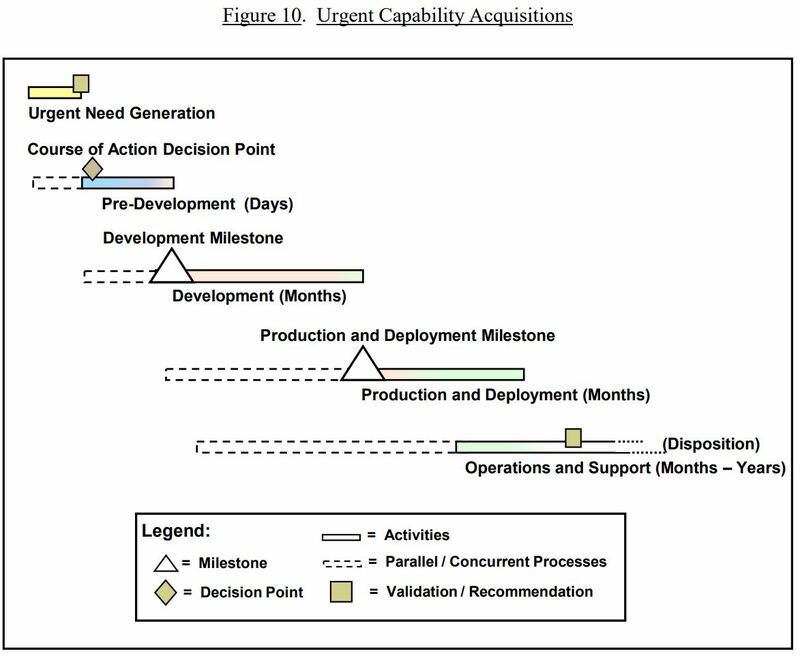 (c) The MDA decides whether to produce and, in coordination with the requester/user, deploy (field) the system, approves the updated Acquisition Strategy (which will include the sustainment plan) and Program Baseline, and documents the Production Decision in an ADM.
(a) During P&D the acquiring organization provides the warfighter with the needed capability, to include any required training, spares, technical data, computer software, support equipment, maintenance, or other logistics support necessary for operation. 1. DoD Components will ensure that the capability and required support (e.g., field service representatives, training) are deployed by the most expeditious means possible and tracked through to their actual delivery to the user. 2. The DoD Components will coordinate with each other and the requiring activity to verify the total number of items required, considering necessary support and spares and training assets for deployed and/or pre-deployment training. (b) Upon deployment, the capability will enter O&S. (1) The Program Manager Designated individual with responsibility for and authority to accomplish program objectives for development, production, and sustainment to meet the user’s operational needs. The PM shall be accountable for credible cost, schedule, and performance reporting to the Milestone Decision Authority (MDA). will execute a support program that meets materiel readiness and operational support performance requirements, and sustains the capability in the most cost-effective manner over its anticipated total life cycle. Planning for O&S will begin during Pre-Development and will be documented in the Acquisition Strategy. (2) The capability is operated and supported consistent with the sustainment plan approved by the MDA at the Production Milestone. (3) The Program Manager or the user may propose urgently needed improvements to the capability. If within the scope of the initial requirements document, procedures in this enclosure may be used to acquire the improvements. If improvements are outside the scope of the validated or approved requirements document, a new or amended requirements document may be required. (4) In collaboration with the original requesting DoD Component, a post-deployment assessment will be conducted after deployment. If practical, this assessment will be conducted in the field by the supporting operational test organization. If not practical, the Program Manager may use alternate means for this assessment to include Program Manager or operational test agency assessment of user feedback or other DoD Component feedback. Post-deployment assessment approaches for all programs under DOT&E Oversight will be independently reviewed and approved by DOT&E. (a) Termination: Demilitarization or Disposal. The system will be demilitarized and disposed of in accordance with all legal and regulatory requirements and policy related to safety (including explosive safety) and the environment. The recommendation will be coordinated with the DoD Component or, for JUONs and JEONs, the Combatant Commands. (b) Sustainment for Current Contingency. Operation and sustainment of the system will continue for the current contingency. Multiple sustainment decisions may be made should the system require operations and support longer than 2 years; however, such sustainment decisions will be made and re-documented at least every 2 years. The sustained system will continue to receive the same priority of action as the original acquisition program. This recommendation will be coordinated with the DoD Component validation authority. (c) Transition to Program of Record. If the system provides a needed, enduring capability, it may be transitioned to a program of record. The disposition official will recommend to the CAE the acquisition point of entry into the defense acquisition system, and whether the MDA should retain program authority or whether it should transition elsewhere. The requirements validation authority will specify the capability requirements documents required to support transition to a new or existing program of record. The disposition recommendation will be made to the DoD Component head for UONs, critical warfighter issues identified by the Warfighter SIG, or Secretary of Defense RAA determinations. (6) The DoD Component head and the CAE Secretaries of the military departments or heads of agencies with the power of redelegation. In the military departments, the officials delegated as CAEs (also called service acquisition executives (SAEs)) are respectively, the Assistant Secretary of the Army for Acquisition, Logistics, and Technology (ASA(AL&T)); the Assistant Secretary of the Navy for Research, Development, and Acquisition (ASN(RD&A)); and the Assistant Secretary of the Air Force for Acquisition (ASAF(A)). The CAEs are responsible for all acquisition functions within their components. This includes both the SAEs for the military departments and acquisition executives in other DoD components, such as the U.S. Special Operations Command (SOCOM) and Defense Logistics Agency (DLA), which also have acquisition management responsibilities. will review the disposition official’s recommendation and record the Component head’s transition decision in a Disposition Determination. The Determination will specify the requirements documents required by the validation authority to support the transition. Programs of record will follow the procedures for such programs described in this instruction. Table 11 provides the Information Requirements that replace or are in addition to the statutory or regulatory requirements in Table 2 and Table 6 in Enclosure 1 that are applicable to ACAT II and ACAT III programs. For urgent capability acquisitions, the documentation procedures described in paragraph 4a(3)(d) will be applied to all information requirements unless otherwise prescribed in statute. STATUTORY; only required for programs responding to urgently needed capabilities. – For programs under Director, DOT&E oversight, combined operational and live fire test plans will be submitted to DOT&E for approval at the Development Milestone; post-deployment assessment plans will be submitted to DOT&E for approval at the Production and Deployment Milestone. DOT&E will ensure that testing is rigorous enough to rapidly evaluate critical operational issues. – Programs not under DOT&E oversight are approved at the Service level; the program may require a rapid and focused operational assessment and live fire testing (if applicable) prior to deploying an urgent need solution. The Acquisition Approach will identify any requirements to evaluate health, safety, or operational effectiveness, suitability, and survivability. COURSE OF ACTION ANALYSIS ● Meets the assessment requirements of Subtitle III, Title 40, United States Code (Ref. (p)) (see Table 10 in Enclosure 1). STATUTORY, replaces and serves as the AoA. Approved by the MDA. For JUONs, JEONs, critical warfighter issues identified by the Warfighter SIG, and Secretary of Defense RAA determinations, a copy is due to the Director, JRAC, within 3 business days of MDA approval. STATUTORY. Optional request to the Secretary of Defense or Deputy Secretary of Defense for RAA. Considered as part of the development of the Acquisition Strategy. MDA approves the decision to request RAA at the Development Milestone. Regulatory. Based on the disposition official’s recommendation in the Disposition Analysis, the Component Head will determine and document the disposition of the initiative and process it in accordance with applicable Component and requirements authority procedures. Due within 1 year of entering the Operations and Support Phase (or earlier, if directed). 1. A dot (●) in a cell indicates the specific applicability of the requirement to the life-cycle event. 2. Documentation required for the identified events will be submitted no later than 45 calendar days before the planned review. identified in Table 2 and Table 6 in Enclosure 1.